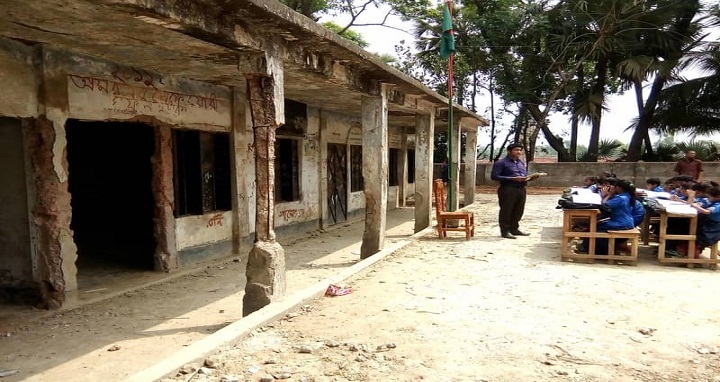 Dhaka, 24 June, Abnews: More than 35,000 students of almost 125 primary schools in five upazilas of Laxmipur district are attending classes inside dilapidated buildings amid heightened risk of an accident occurring. In the meantime, the school buildings in such appalling condition as to make the risk imminent have been listed as risky due to lack of maintenance and renovation for long. According to district education office, there are a total of 731 government primary schools in five upazilas of the district. Portions of ceiling have loosened and cracks have developed on various parts of 125 of the school buildings. The roof can collapse at any given moment. Over 35,000 students are said to be attending these 125 schools. Of them, Charmoni Mohon Government Primary School is said to be in the worst condition of all. Several hundred students are studying in the school. Already, at least five students of Charmoni Mohon Government Primary School were injured as a creaky ceiling collapsed on the attending students. Now students are attending classes in a state of panic as the building may collapse at any moment, said students, teachers and guardians. Although letters were sent to the district education office many times describing the dilapidated building's risks, they are yet to get any response from the concerned authority, alleged teachers and guardians. Some other students in the district have been similarly injured as portion of the ceiling collapsed on them while attending school. Now students do not want to attend classes in fear that their buildings may collapse. Guardians also are afraid to send their children to school, guardians said. District primary education officer Abu Zafar Mohammad Saleha said that they have formed a committee to enlist risky school buildings. In the meantime, we have sent a list of risky building and the renovation work will be started soon after having approval of the allocation. The authority will soon get government allocation to renovate the schools, the officer hoped.